This is Shadow's Lucky Charm. She is 15.2H & 1200 lbs. Look at her papers & you can see why her gait is so natural. She is my husbands personal horse & the horse we let people try that have never ridden a fox trotter before. Her gait is all her. Look at her huge reach & my Minnesota friend isn't all humped over or riding her with a tight rein. She has never been in the show ring or a trainers barn. She is as natural as they come. 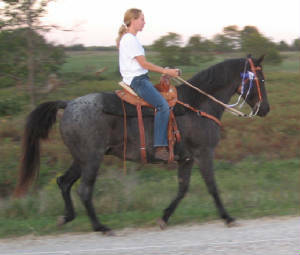 You can tell by this picture she's right out of the pasture & she actually has a 4 month old colt on her at the time. Presently she is not bred. The only way I will breed her is if the foal is sold before she's even been exposed. 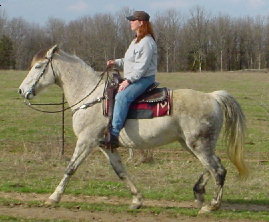 She is that valuable under saddle. You can see the way her colts travel on the page titled "Moon's Colts". His name is TNT. He's big, he's fire engine red & he's MY personal saddle horse. Every time she goes out & wherever she goes she will get at least a couple of complements on her ride & her looks. Watch & maybe you'll see her & I trying some versitility classes this summer. She has already shown me that she can cut a steer & enjoy doing it!